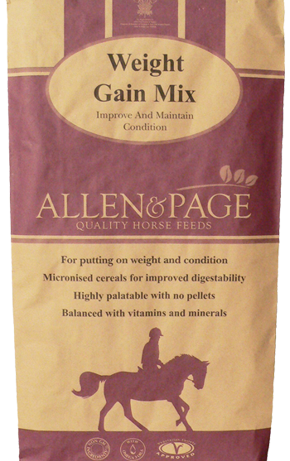 Weight Gain Mix is formulated without pellets and is micronised for improved digestibility. The inclusion of peas, linseed and soya oil, together with carefully selected herbs that work in synergy with other ingredients, provides an extremely effective feed for putting on weight and condition. Weight Gain Mix is ideal for show horses, poor doers and for use during the winter when weight is harder to keep on. Not suitable for horses with intolerances to barley or molasses.